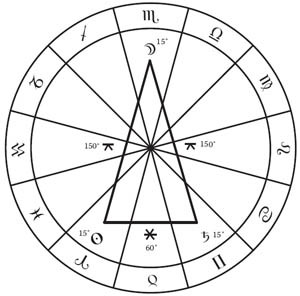 A yod is a planetary pattern that occurs when two planets form a close sextile with each other in a chart, and then both planets also simultaneously form a quincunx aspect with a third planet. For example, if the Sun was at 15 Aries and it was sextile to Saturn at 15 Gemini, and then both planets were also quincunx the Moon at 15 Scorpio. This would be an exact yod. See the diagram to the right for an illustration of the above example. Some astrologers ascribe a high degree of importance to yods, sometimes giving the configuration lofty titles such as the “finger of god”. Others simply see it as a midpoint pattern, so that the planet at the apex of the yod is directly opposite to the midpoint between the two planets in sextile. Yods only appear to have been recognized somewhat recently in Modern western astrology, beginning sometime around the mid-20th century, and they do not appear to have been mentioned in older sources.